The latest column exploring one of the conference themes — that of childbirth — is written by conference co-organiser, Dr Jennifer Evans. The Perceptions of Pregnancy conference is aiming to cover all aspects of fertility, pregnancy and childbirth. 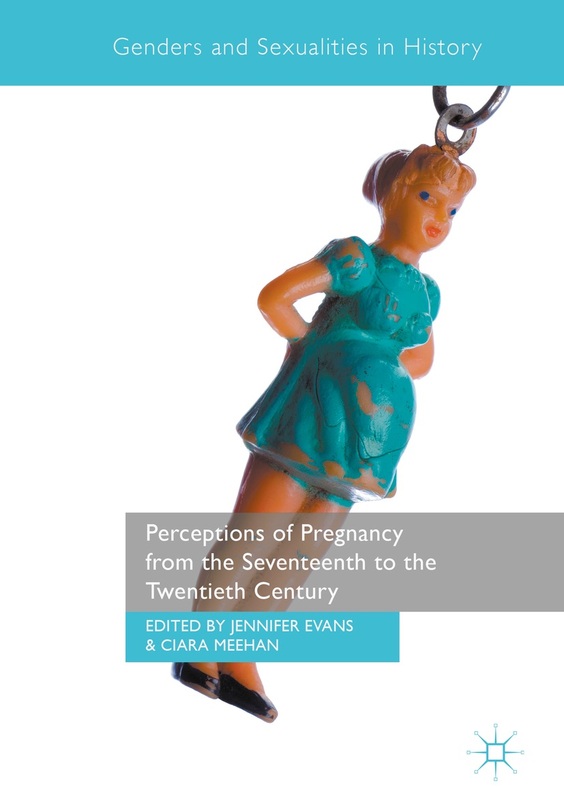 My usual area of research is fertility and infertility, however, I often make notes on anything in the sources that has to do with the process of having children and so I’m going to make a brief diversion from my usual discussions and talk about labour. Today we feel very lucky that during childbirth we have access to a range of pain relief that can help alleviate the intensity of contractions. Indeed, I am hooked on watching One Born Every Minute and it seems that some midwives feel women are too ready and eager to undergo an epidural that could lengthen the duration of their labour. Women in early modern England did not have access to epidurals, pethidine and entonox (gas and air), but they were not simply left to endure labour without any form of medication. As is well attested, in the primary and secondary literature, women were given caudle throughout their labour. This was a thick wine-based drink containing sugar or spices, which may have provided some relief from pain. Manuscript remedy collections (recipe books) kept by families show that some caudles were designed with specific functions in mind: the recipe book attributed to Elizabeth Okeover included ‘A Caudle for a woman with a flux in childbed’. In this case the remedy was meant to help in the event of an effusion of blood. A note added into the margin claimed that it was ‘very good for a lask Provd in childrebed or any other time’. [Wellcome Library, MS 3712 p.9] Notes such as these give us an indication that these remedies were produced and used, not simply recorded in a book and forgotten about. In this case the remedy is being used for a broader purpose than that suggested in its original title, as it is now being used for a looseness of the bowels. In addition to caudle recipe books included a range of medicines for use in labour. Some were designed to help women whose contractions were not strong enough, or were not coming with the desired frequency. The recipe book of Mary Glover, for example, included the information that stone horse (an un-castrated stallion) dung water provoked women’s labour and eased after pains. Lady Ascough’s recipe book, similarly, contained a remedy ‘To Bring throws’. Bridge Hyde’s book was more effusive about the intended results of her medicine, it is titled ‘For a woman in labour for speedy delivery, if their throws have left them or be in danger.’ It is plausible this remedy was to help a woman suffering from exhaustion after a long labour. a powder for women in labour ‘Take of white amber saffern myrhe graines of paradice beates stoned a dram of each five drams of cummonseed make al these into fine powder & make it into a ball with a litle peece of gumdragon steeped in a little harts horn jelly and put in as much of the jelly as wil wett it so beat it in a morter very well & make it into balls set it to dry in a warm place you must give as much of this powder as will lye on a sixpence’. 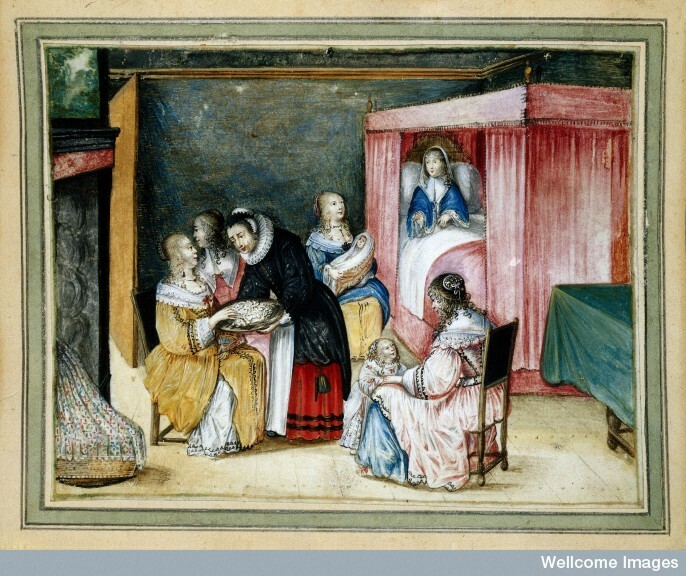 A Dutch birth-room, with a maid giving sweetmeats to gossips. Labour in early modern England, then, was not necessarily an un-medicated experience. Indeed for those with the wealth necessary to produce remedies in the home it could include a range of remedies designed to stimulate labour, ease pain, give strength and aid recovery.